If you’ve ever witnessed seizures in senior dogs as I have, you’ll know how frightening they can be. While seizures can indicate epilepsy, it is uncommon in a senior dog, and more likely the result of other conditions. and Red had been sleeping for about 2 hours or so. She was on her bed in the living room, out of my line of sight. All of a sudden I heard a loud bang, and horrific cry. I jumped up and saw Red lying in her bed shaking. I had never experienced this before, instinct took over and I picked her up to comfort her. She peed all over me and the carpet, and after a few seconds she was fine and went back to sleep like nothing happened. Of course I ran and woke my husband, then called the emergency hospital. They calmed me down and assured me there was no reason, at that point, to rush her in, but suggested I call my vet in the morning which I would have done regardless. I asked for advice should it happen again and was told not to pick her up while she was having a seizure, and to turn the lights off. Needless to say I watched her like a hawk that night. Since then she’s had a few seizures, and they’ve followed the same pattern. Late at night while she was sleeping, starting with a heart wrenching cry, peeing on her bed, then carrying on sleeping. Until Saturday night Dec. 17th 2016 I had never actually witnessed her having a seizure. We were driving from England to Spain, and stopped in a hotel overnight. The dogs were with us in bed (I wasn’t going to let them sleep on a hotel room floor), with Red lying next to me. I noticed her starting to twitch and I told my husband I thought she was about to have a seizure. Her head went back, all four legs stretched out in front of her as though she was stretching and her body started to shake. She never woke up and continued to sleep after the seizure was over, which again lasted only a few seconds. anything I could have on hand for peace of mind. He gave me a syringe of rectal Diazepam should she ever suffer a more severe episode. Now that Red is being treated by a holistic vet who has replaced a couple of her medications with supplements, and put her on a fresh homemade diet, it will be interesting to see how things improve and change. Is it possible to tell when a dog is about to have a seizure? 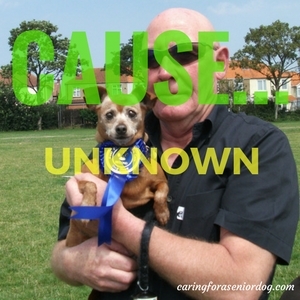 It is not uncommon for older dogs to develop seizures which are idiopathic, meaning there is no known reason for them. I found this video by Dr. Karen Becker extremely informative, with so much helpful information about understanding seizures and what causes them. In Red’s case she only has seizures while she’s sleeping. Each one started with a heart stopping (for me) horrible high pitched cry. My vet said it was because she knew something was happening, but didn’t know what. This is the stage when your dog will experience a seizure, the symptoms of which will vary depending on its’ severity. They can be anything from growling and twitching to violent spasms and convulsions. Red,’s head goes back, her limbs are outstretched and stiff, she loses control of her bladder and it’s over and back to sleep. This is the recovery stage, when your dog will feel the seizure’s effects. The amount of time he will be feeling the effects will depend on how severe the seizure was. As I mentioned above, because Red’s seizures have only ever taken place when she was sleeping, she would fall back to sleep immediately and wake up like nothing happened. They are painful for us to witness, but not painful to the dog. Here is what Dennis O’Brien, DVM, PhD, Diplomate, ACVIM, Specialty of Neurology, University of Missouri, College of Veterinary Medicine has to say about the effects of seizures. “Most seizures are brief, and with proper treatment, the pet can lead a normal life. None-the-less, seizures are serious business and even short seizures can cause brain damage. That damage tends to be cumulative over time. If the seizures are short, the main effect is an increased chance of another seizure in the future. Thus, there is a tendency for epilepsy to get worse over time, especially if left untreated. Don’t panic. Easy to say, hard to do. 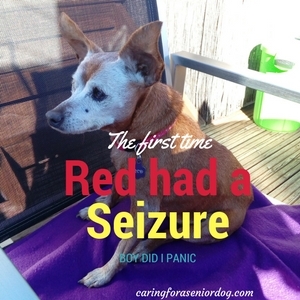 When Red had her first seizure I was completely clueless, and boy did I panic. I was advised to never pick her up in the middle, and turn off the lights. As soon after the seizure as you can (assuming it wasn’t severe enough to rush your dog to the vet), write down as much information as you can. What was your dog doing right before it happened? Any unusual behaviour? Seizures in senior dogs are often the result of an underlying medical condition, so your vet will decide what kind of tests, if any, he feels are required. They can be things like blood and urine, as well as CT or MRI. Whether he starts investigating immediately, or prefers to adopt a “wait and see approach” is something you will discuss with him. Whether or not you are prescribed medication is of course up to your vet, a decision based on frequency and severity of the episodes. Red does not take any, yet a friend’s senior dog was given something daily. The two most commonly used medications are phenobarbital (PB) and potassium bromide (KBr). Neither are guaranteed to be 100% effective in every dog, and according to 1800petmeds there is the risk of side effects. Here is some information, again from 1800petmeds, you may find helpful should you wish to consider chemical free options. As someone who shares their life with a senior dog who has had seizures, I can tell you it scares the hell out of me. Sometimes late at night I worry it may happen again, and dread that cry that precedes another episode. Having said that. seizures in senior dogs is not a given so don’t worry about it unnecessarily. 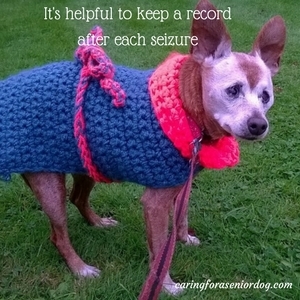 Does your senior dog experience seizures? Has your vet determined the cause? Prescribed any medication? How have you been handling it? It would be great if you could share your story here, or on my Facebook page. Don’t be surprised by how many people it could help. I had a lab that used to have seizures. Her biggest trigger was dehydration, so I was always urging her to drink. I think it’s really interesting you knew her trigger. How did you come to that realisation? 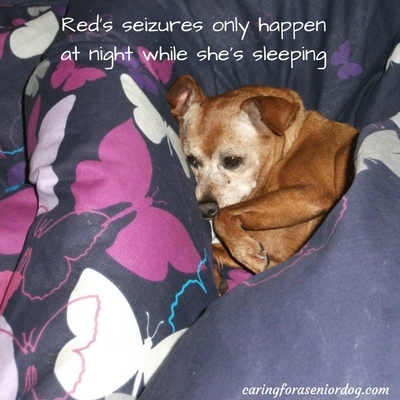 Red’s seizures only happen at night while she’s sleeping. It’s definitely scary but you’d probably be calmer than you think, I just hope you never need the information written in this post. Thanks for an informative post. Thankfully, we’ve never had a cat with seizures but Max does have asthma and after six months of being asthma free, had a bad attack yesterday, they’re enough to scare me. Sorry to hear about Max’s attack, I know how terrifying they can be, but hopefully he’s recovered and doing well. What makes them so much scarier for me was my lack of transport and emergency hospital where I was living. That’s when you feel so helpless. I’m glad you found this post so informative, and I appreciate you wanting to share it. It really is so scary to witness, especially when you have no idea what’s going on or what to do about it. Fantastic detailed information Hindy, thanks for sharing this. It can help a lot of people & their dogs. Sharing! Thank you Cathy. Seizures are so scary to witness and the first time Red had one I had no idea what was happening. I do hope this article helps anyone who may face or has faced this. Thanks for this post, Hindy. As you know, Dexter has a neurological condition. The condition can also include seizures or have seizures in the future. A few weeks ago Dexter had a bit of a head shake. We are now doing physical therapy, and so far, we haven’t seen any other head shakes. Hoping it was just a fluke. But it’s nice to have the post to read. Thanks Tonya. I do hope Dexter’s head shake was just a fluke, but it would be interesting to know if the therapy helped as well. The natural/holistic approach is so very interesting – we had not heard of some of these, thank you for sharing! We must say that Red is just so adorable and I hope that he is doing better and managing – you are so wonderful to care for him. Seniors just have a special place in our hearts – they are such pure love. Blessings to you and yours! That’s so nice of you to say Rebecca. Red is doing really well, and she is too cute for words in my opinion. Seniors do have a special place in my heart, they’re the only age group I like to share my life with. Thank you for sharing this! My dogs are technically seniors (8 and 10 years old) and although they are in good health, it is always better to be prepared. I hadn’t even thought about what to do in case of a seizure. Hi Beth, great to hear your dogs are such good health. You’re right about being prepared which I was not when Red had her first seizure. I had no idea what was going on or what to do – very scary. My darling Isabelle had a few seizures right before she died. Great info to share. Kilo gets odd twitches and shakes sometimes but hope he is OK. So sorry to hear about Isabelle, and what a lovely name. Hopefully Kilo (another great name!!) is doing well. What has the vet said? I remember when Gracie had her first seizure. I was just a teenager and I was certain that she was dying. It was horrible. Thank you for spreading awareness on this issue and helping owners know what to do if it ever happens to their dog! I imagine it must have been frightening to see Gracie have a seizure. I don’t think I handled it any better as an adult to be honest. I was totally unprepared when Red had her first seizure, I can only hope my experience will help others. I’ve never seen an animal have a seizure. I had 2 gran mal seizures about 40 years ago and the doctors could never find a cause for them. They were quite scary. I can’t imagine how scary they must have been for you, but it’s good to hear they were a long time ago and you’ve had no problems like that since. I can’t even imagine how scary that must have been to witness! My best friend’s dog had seizures, and I remember how upsetting it was for her. I’m sorry that Red has these, but at least they are minor ones. Thanks for sharing this extremely helpful information! What I find most scary is the fear they will not only last a few seconds, then what do you do? Such a wonderful post! Seizures are scary but knowing what to do is so important! Glad you liked it! As scary as they are, knowing what to do in the moment makes it a little easier to handle. Seizures are terrifying to witness! I have not seen one in my pets (thankfully), but I have worked in special education and seen them in humans. It is like something from a horror movie even when it does no damage. I would be very upset to see one of my cats having a seizure. Thank you for sharing this very important information. Thanks Robin. I can’t even imagine what it must be like to witness a seizure in a person. I felt so helpless when I saw Red’s seizures. It’s late at night, no car or 24 hour emergency hospital where I lived. Not an ideal scenario that’s for sure. Oh Linda I’m so sorry to hear that. I know it’s absolutely terrifying, yet when it’s over they go back to sleep and carry on like nothing happened. I’m glad she was over it quickly and is fine today. Have you mentioned it to your vet yet? In my experience if it’s a one off or very infrequent, there’s nothing the vet will do. It’s if they become more regular that the medication starts, but I don’t know if that’s how most vets handle it. I know someone that uses CBD oil when her dog has a seizure, but his are long and quite serious. I’ll be writing about CBD oil in the near future so stay tuned. Thank you, My 12 year old shepherd just had a seizure for the first time. This help me a lot. I’m very sorry to hear that, I hope your dog is doing better. I’m so very sorry to hear this Shena, I know how devastating it is. 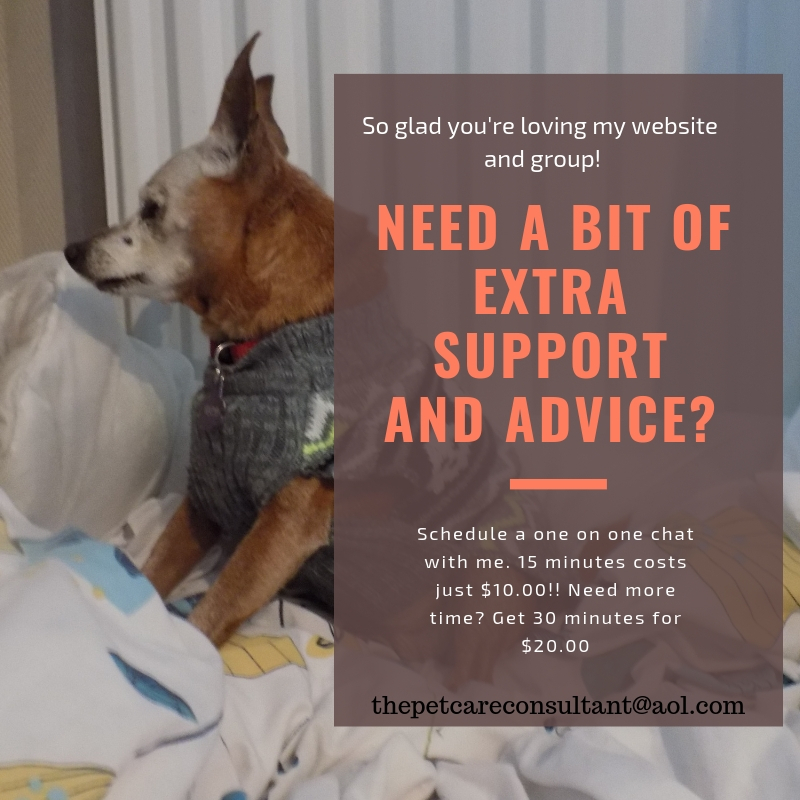 Perhaps you’d like to join my Facebook group, Senior Dog Care Club. Perhaps you can ge some clarity from others who are going through the same thing you did, and it might help you find some peace. My 3 pound maltese is 14 and yesterday had three seizures in a row. Ran to the doctor and they gave her a shot to calm her down. Then we were driving home and I turned around and went back to the vet. By the way she’s also blind since eight years old sards. She also has kidney disease. I don’t want the vet to do too much except medication. I just want her to be with us. She doesn’t seem like she’s in any pain. Today she won’t eat or drink but she did yesterday when we came home from the vet. She threw up before she ate then seemed ok and she wanted to eat. She slept on and off all night. What do you think is her time over? The vet wants to do test after test I will not put her through that. Please give me your opinion I don’t know what to do. Robyn I’m so sorry to hear that. I recommend you join my FB group Senior Dog Care Club as you will get a lot of support and advice there. The lack of interest in eating and drinking and the throwing up could be kidney disease, could be mild pancreatitis or something else. Sorry but it’s impossible to determine what’s wrong without blood and urine tests. I don’t know what your vet has done, or what he wants to do, but those 2 tests will give you a lot of answers. If you don’t trust him, or feel like he’s taking advantage find someone else. My sweet Sadie Belle is 11 years old. She has had seizures for about 7 months. She is currently taking phenobarbatal 2 x/ day and a liver enzyme 1 x/day. She goes long periods of time without them. She had one Monday, after not having any for months. We rushed her to the ER vet b/c it was different than ever before we literally thought she was dying, but they did all the normal test and everything was good. Of course they said we could do an MRI to see if she has a turmor, but of course we said no. We know it is neurological we have accepted that. So since her seizure Monday she has just acted so weird and been defecating in her cage daily when we leave her. She continues to pace around but is fine when giving her attention. She sleeps in the bed with us nightly and never has accidents. We have not changed her food since this is the same food she has been on since age 1. Any help, tips, or advice would be GREATLY appreciated!!! Jennifer I’m so sorry to hear what Sadie Belle is going through. My very best advice would be to join my FB called Senior Dog Care Club. You will find a ton of help there. I have a 12-year-old chihuahua who I believe is having seizures. He has had 4 so far. The first 3 I didn’t witness, only noted that horrible cry with the first one and he was incontinent of urine all the other times. The vet said he thought it was because of his worsening heart murmur and had passed out. He only has them at night with the exception of the one this morning that I finally witnessed. He will be going to the vet tomorrow. What you described with your dog is exactly the same as I have seen with mine. Thank you for posting your experience. It has confirmed what I expected to be wrong in the first place. It is definitely a scary thing to witness and I hope I can get him the right treatment to control them. Otherwise, my little guy doesn’t act like he’s 84 in human years. 🙂 Good luck with your fur baby! I want to thank you so much for sharing your story. We have a Chihuahua named Gizmo who just started having seizures. You are the first that I have read that the pet had theirs only when they sleep ans that awful scream. I was afraid there was more to his illness than just the seizures and your information has eased my mind. He is the newest of our additions but in the 2 years we have had him he has been a constant companion to me as I have undergone cancer treatments twice. Again…thank you for sharing. Hi, my 12 year old chihuahua/Yorkie has been having very mild focal seizures for about a year now but I feel they are getting worse so have been prescribed phibarbitol. I can’t bring myself to give it to her yet as I don’t want it to change the beautiful little sprightly dog I have. She’s healthy in every other way as I’m no other meds. Has anyone had a bad experience with the drug?